Red lighting on a Team Green GPU!? Nvidia continues to surprise us with new graphics cards, and today it just released a teaser for a new Titan X Collector’s Edition. Although Nvidia only offered up an extremely short 13-second video, seen below, we’ve nevertheless scrubbed through it frame by frame for juicy tidbits. There’s no mention of specs, much less anything, but we do see this collector’s edition card sporting a new reference design from Nvidia. It appears to be much more linear and industrial. What’s more, it appears that Nvidia’s next design for its best graphics cards will include more lighting with a green light clearly illuminating the graphics card’s vapor chamber and heatsink fin array that will still sit beneath a small acrylic window. 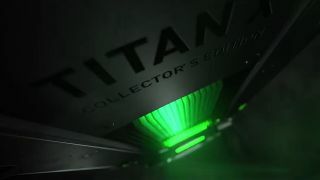 Interestingly, it looks like the lighting could be customizable, as in one frame of the video there’s a second glowing red graphics card opposite of the Titan X Collector’s Edition. This could just be symbolism of the eternal struggle between Nvidia and AMD, but the team red does not produce a part that looks anything like what’s in the video. A closer look at the acrylic fan cover? It also seems like the fan on this new GPU will also stick out from the frame with its own acrylic element, but the short glimpse of it is heavily shrouded in darkness. It’s possible that Nvidia will announce the Titan X Collector’s Edition at CES 2018, especially considering it has a scheduled keynote at the show. Strap in, because Titan X Collector's Edition could well be the design we see on the component maker’s forthcoming, next-generation Volta architecture.